Disclaimer: This guide is for educational purposes only. 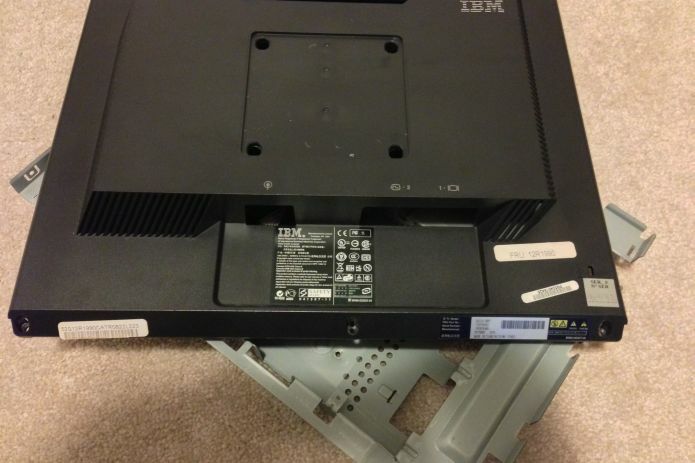 If your monitor is still under warranty, do not open the case or you might void your warranty. There is a risk of electric shock that can cause bodily harm if you are not careful when following the guide. Proceed at your own risk – I am not responsible for any damage or injuries. 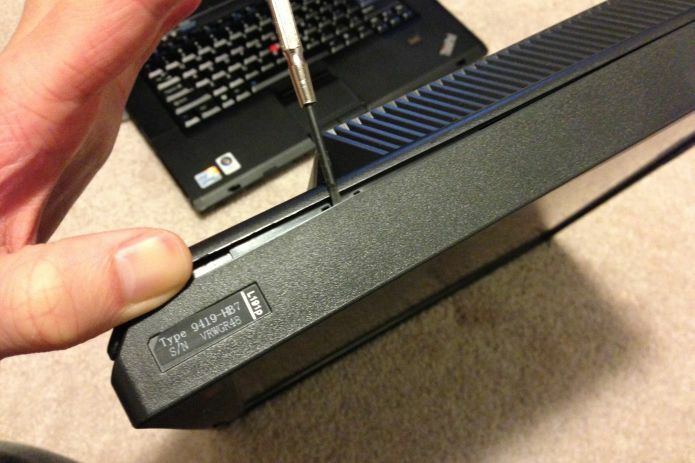 Start by discharging the PSU by removing the power cord and pressing the power button a few times. The PSU generates high voltages and there is a risk of electric shock if you do not take precautions to discharge the capacitors. If you want to be extra safe, leave the monitor unplugged overnight to let them discharge on their own. 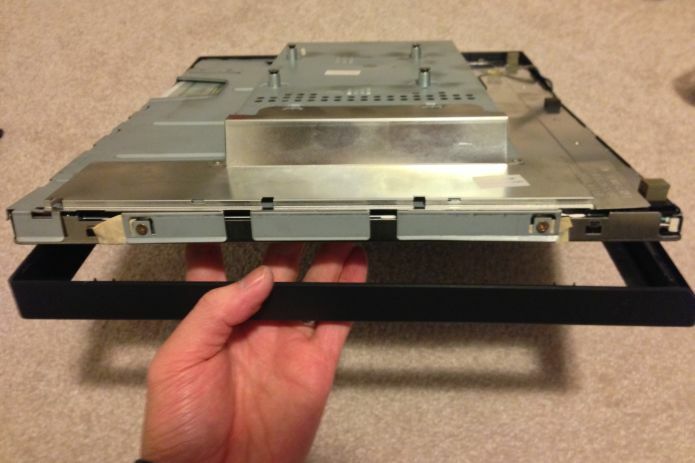 Remove the stand by the four VESA mount screws. Once you have the monitor by itself, along the bottom there are three rubber plugs. 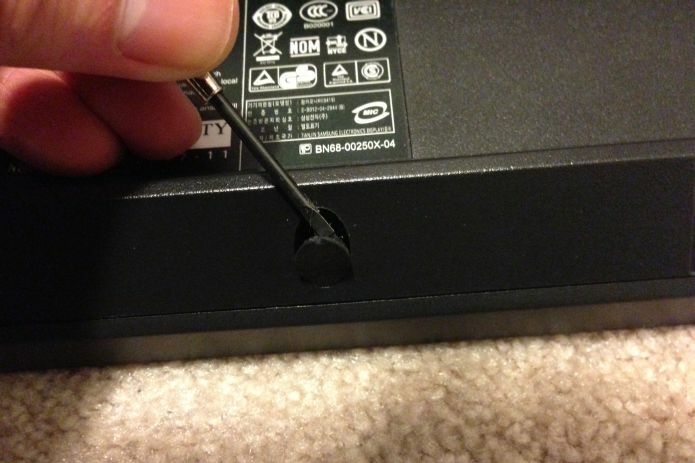 Pry these out with a small flat-head screwdriver, then remove the three Philips screws. You will now need to remove the LCD bezel. 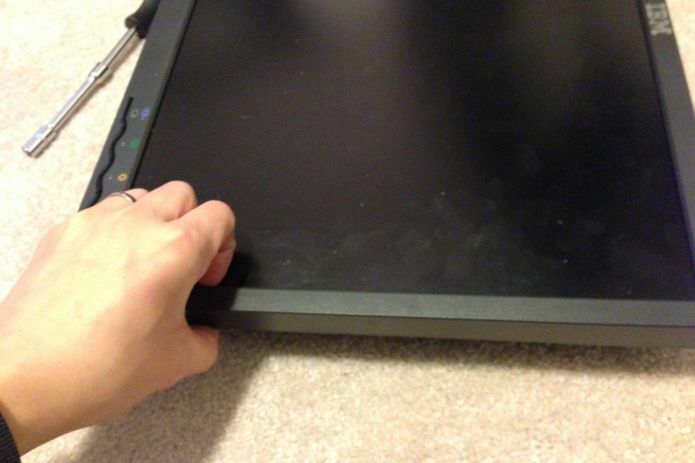 Sometimes you can pop it off by slipping your fingers between the panel and the bezel, then pull up and outwards. Do this on both sides. Sometimes it is easier to start on one of the bottom corners, usually near the power button. Continue on both sides until everything is released. 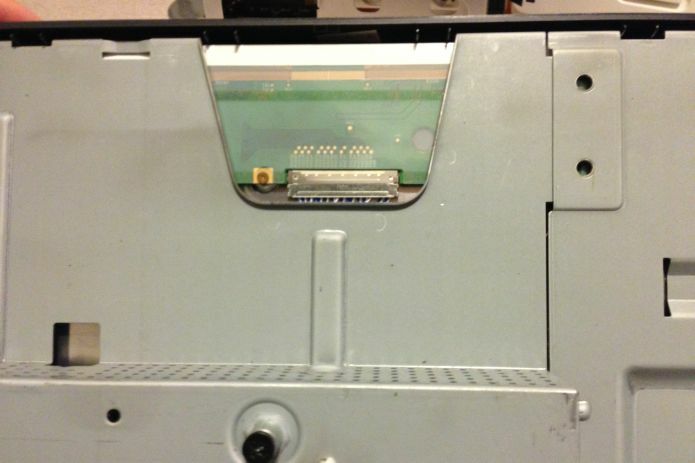 The back panel will come off revealing a metal body. Pull the front bezel from the metal body. 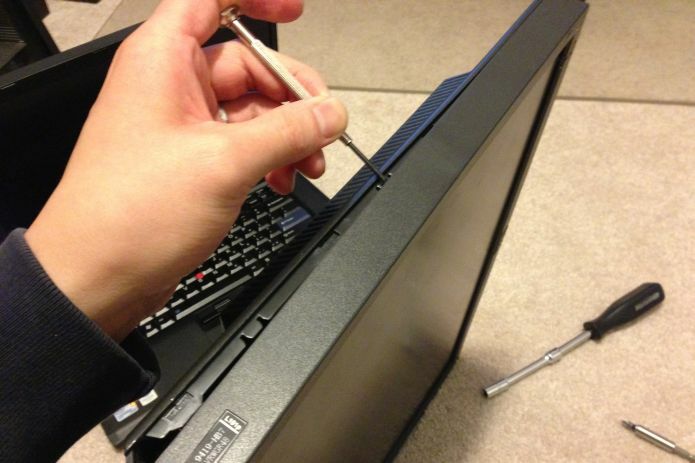 Remove two screws from both sides of the monitor. 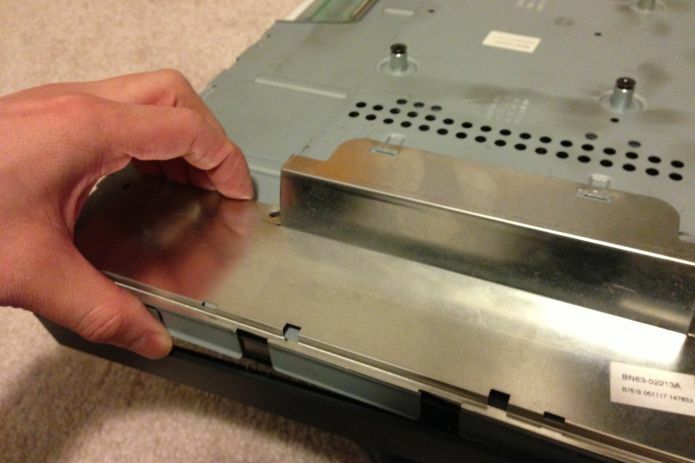 When that is done, remove the metal shield by pulling outwards from the monitor. This will reveal the backlight wires. Disconnect these. Order doesn’t matter. 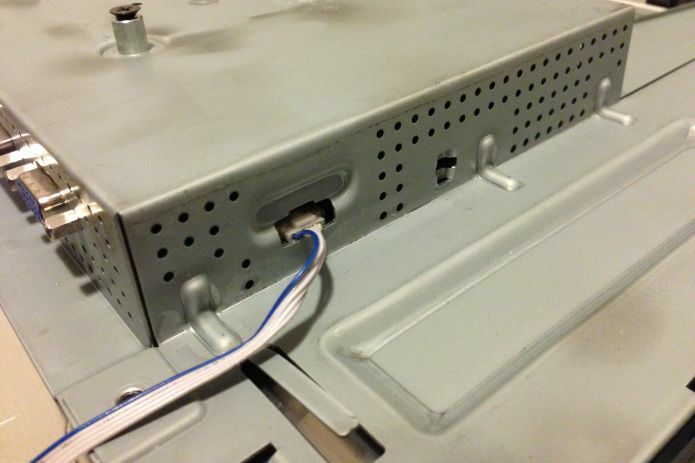 On the right side of the panel, remove the cable that connects to the buttons on the bezel. Finally remove the cable connecting to the panel. Be careful not to damage this. 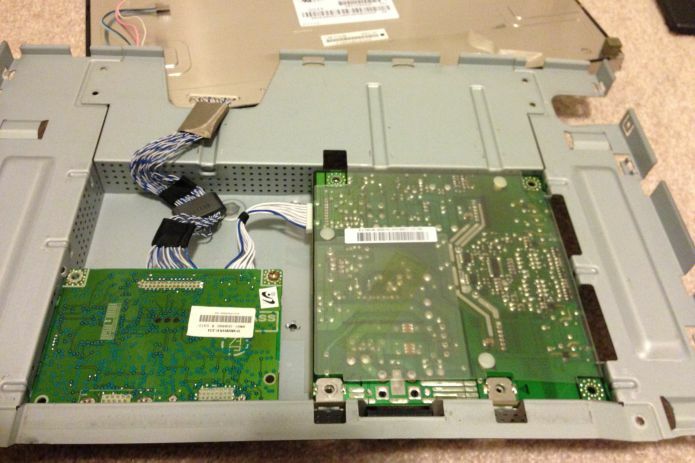 Now you can remove the entire metal backing revealing the LCD timing controller (TCON) and the power supply. Remove the three screws holding the PSU board (right hand side). Disconnect the cable that leads to the TCON. Visual inspection of this unit reveals nothing damaged, though the silicone glue is already cut away from the purple capacitors. 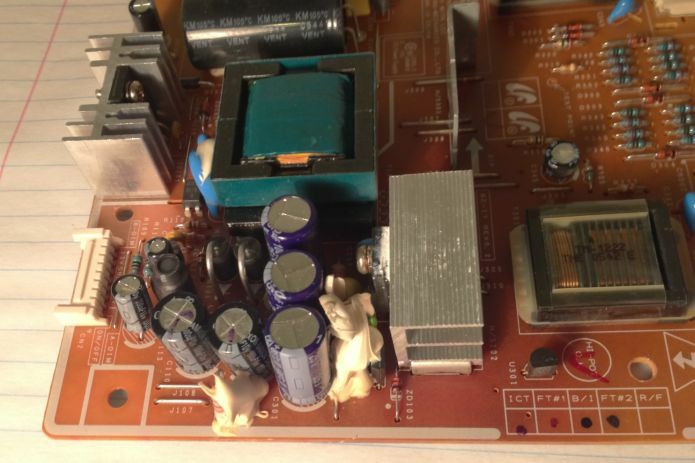 From previous repairs I’ve done, those purple capacitors are usually three Samxon 820uF 25V caps that fail and start leaking. This board appears to have already been serviced with those capacitors replaced with some unknown brand and higher capacitance. The 1000uF 10V shorter black capcitors look like they were not touched. From prior repairs I’ve usually seen all of them being Samxon brand. The strange stickers on the back of the monitor casing indicating an FRU and serial number may be an signs that this went in for repair once before. Flipping the board over revealed some really shoddy repair work. 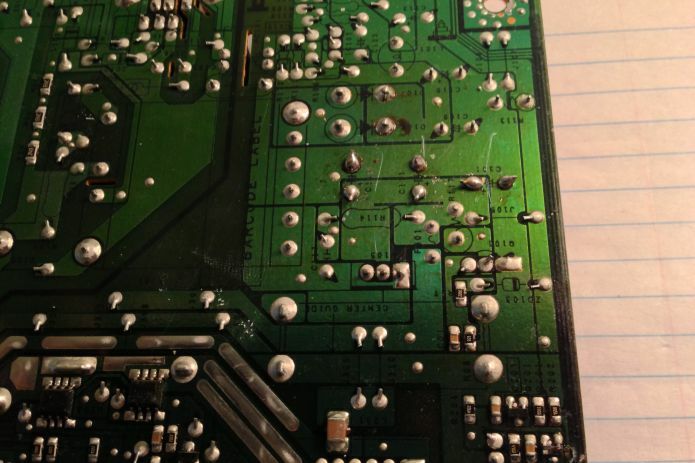 The PCB is scratched and gouged, there is still a lot of flux residue, and bits of solder that wasn’t cleaned up. 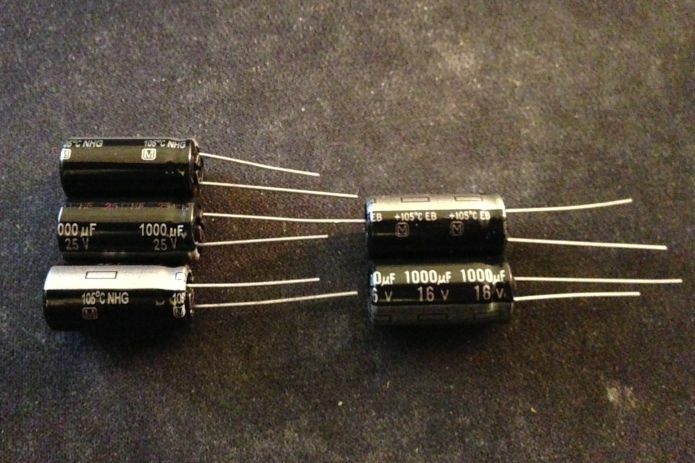 Here are two sets of capacitors removed from two different L191p monitors. The usual Samxon (on the left) from a monitor I repaired earlier, the weird purple ones (in the middle) from this monitor, and the usual Samxon again on the right. 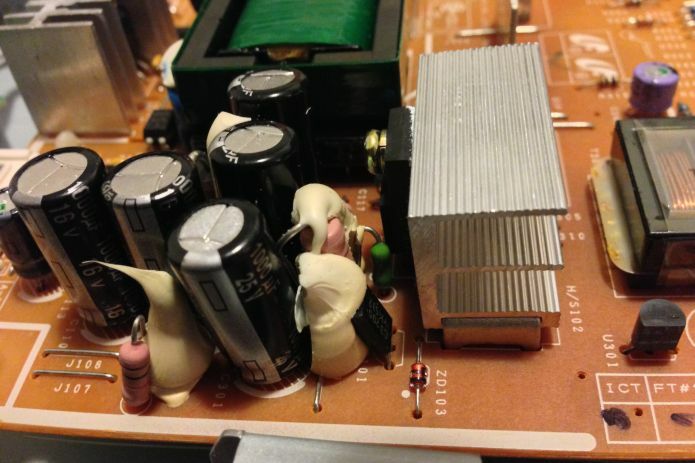 Look at the crazy readings on these capacitors that were removed. Even though these capacitors had no visual indication of failing, the high resistance was causing this particular unit to not power on properly. Typically they are in the one hundredths range. So let’s replace them with some quality Panasonic caps. Here I will be replacing everything with 1000uF caps because that’s all I have on hand. The 10V caps will be replaced with ones rated for 16V. Don’t worry about going up in spec, as the voltage rating just means it can handle up to that amount. I recommend buying from a reputable company such as Digikey or Mouser so you can be confident that you don’t end up with fakes. Here is the board with the main cluster of caps replaced. Note, the little green guy beside the aluminum heatsink is a 3A 125V pico fuse that sometimes blows when these capacitors fail. 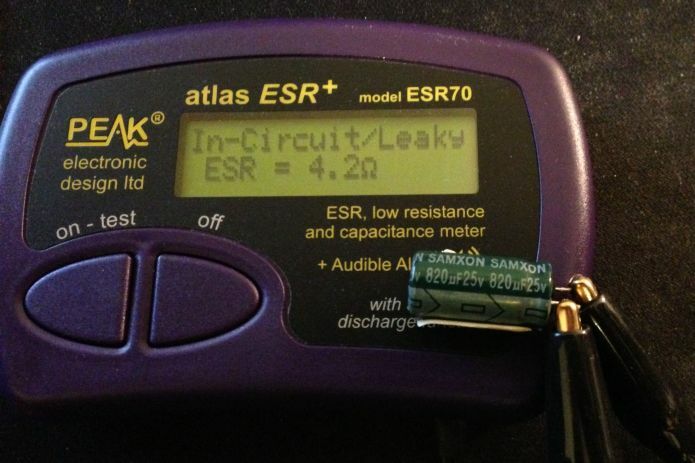 Test it for continuity with your multimeter to see if it also needs to be replaced. 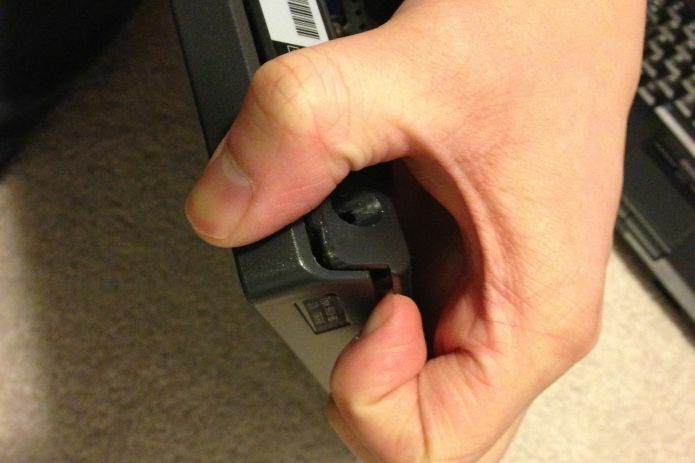 Reassemble the monitor by following the above steps but in reverse, cross your fingers, and press the power button. 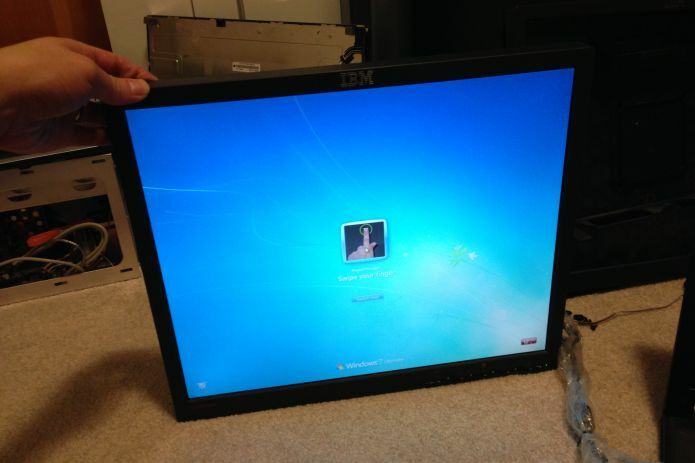 For about $5 and 30 minutes of your time, you can save a fine monitor from going into the landfill. I have already repaired five of these monitors and they all had failing capacitors, and only one required a new fuse. If you have a Samsung (branded or OEM) LCD built around 2005, chances are the capacitors are going to be Samxons, and chances are that they will be the first thing to fail. 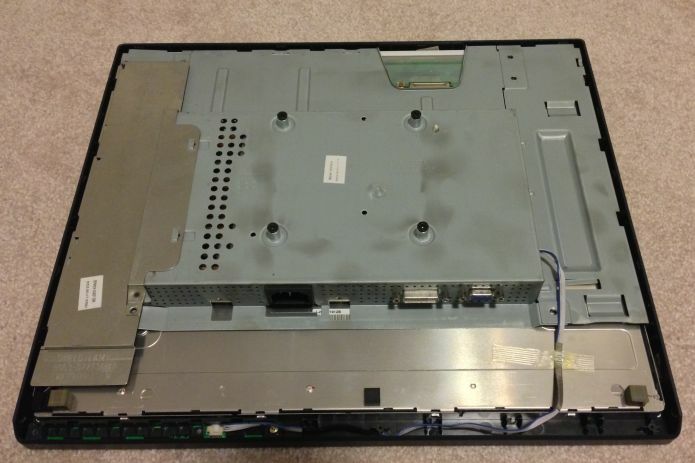 If you want to do some preventative maintenance, open up your monitor (it’ll be long out of warantty anyway) and do a quick inspection. Good luck, and happy repairing! I have two L191p monitors where the backlight gas gone out. 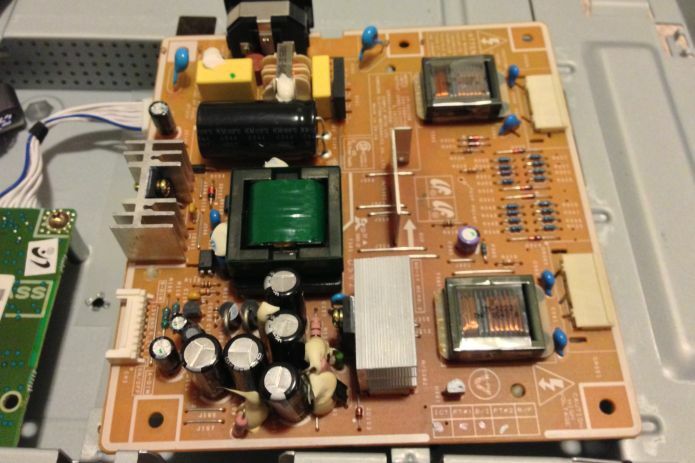 Do you perform this capacitor replacement process as a service for these monitors? 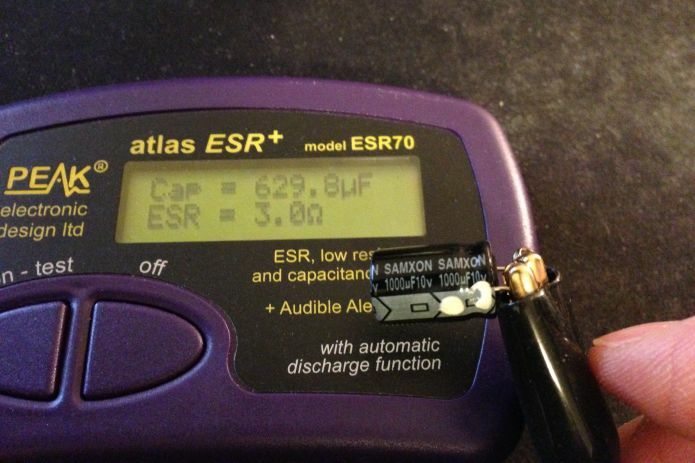 When the capacitors fail, it can lead to premature backlight failure due to the voltages being out of spec. 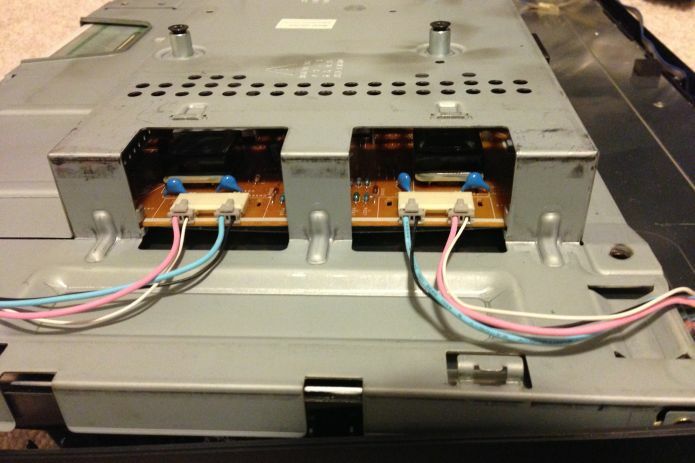 If the backlight CCFL tubes have burnt out, you will need to disassemble the panel to service. It’s a delicate procedure and a bit hazardous as the CCFL tubes contain mercury vapour. Usually the screen begins to turn pink as the CCFL backlight begins to degrade. 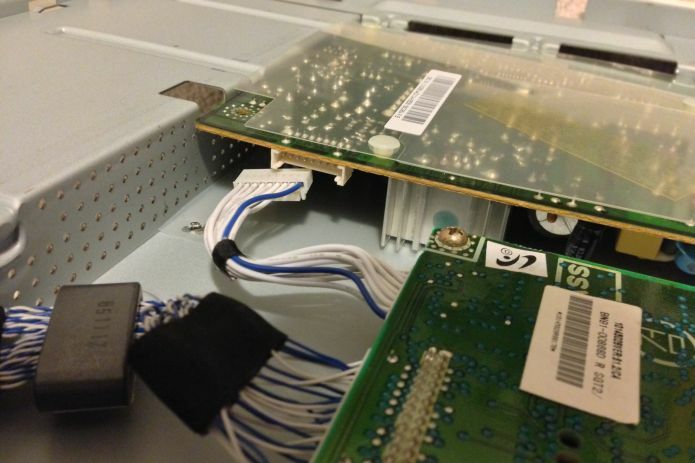 It would be worth opening the monitor and spot checking the capacitors as the stock power supplies will all eventually fail in the same way due to the (relatively) low quality parts being used. Sir i have an IBM ThinkVision. After turning on the screen will just turns on after 5 seconds it turns off. I already examine it and only the backlight is gone…i already replaced the Capacitors but still the problem persist…can you help me??? It gets tricky once it gets to the point where the PSU shuts down like this. Did you check the large capacitor (the one about the size of a thumb) as well? 1. One of the CCFL backlights are failing (L171 and L192). You would be able to notice a pink tint on the screen when it was last operational, or by disassembling the panel (not recommended) and looking for black “burn” marks at the ends of the tubes (they are fragile!). 2. Some of the smaller capacitors sized 10uF/25uF can fail and still appear in OK condition (T860). Best to use an ESR meter to troubleshoot those. 3. 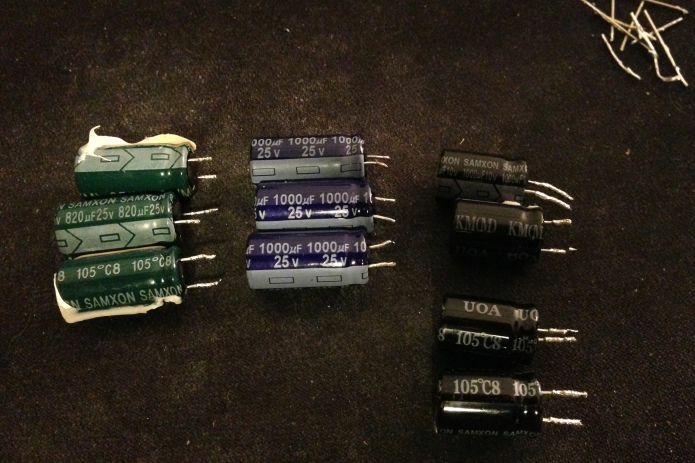 Transistors can fail, and troubleshooting these get a bit more complicated.